Chop beets, either via food processor or by chopping finely with a knife. 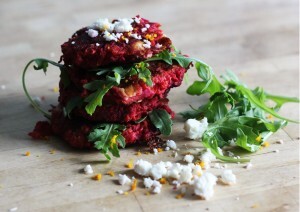 Combine chopped beets, dill, mint, garlic, feta, eggs, salt, pepper, and flour. Heat canola oil in skillet over medium to high heat. Once the oil is hot, form patties from the beet mixture and carefully place in the skillet; cook until lightly browned (about 5-7 minutes on each side). Top with zesty sour cream sauce (see recipe below) or other sauce of your choosing! Combine all ingredients and mix well. Add additional salt, lemon juice/zest, and garlic to taste.